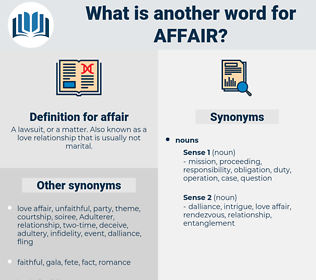 What is another word for affair? A lawsuit, or a matter. Also known as a love relationship that is usually not marital. what one is in to. situation, lover, file, episode, point, bond, regard, conjunction, bonding, venture. 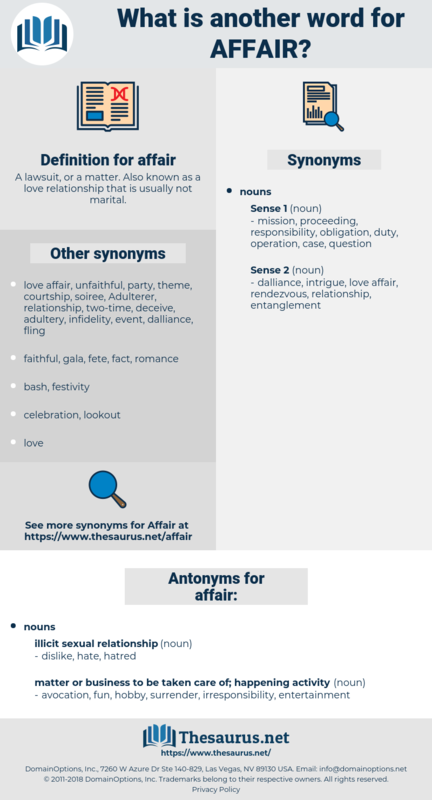 dossier, mistress, thing, fling, liaison, romance, question, topic, history, linkage, problem, case, saga. avocation, fun, hobby, surrender, irresponsibility, entertainment. Your lost time and trouble is your own affair. Of the affair itself but little need be said. affray, au pair, apiary, appro, apery, afire, afro, appear, aver, averrhoa, aperea, abor, a priori, avower, aviary, apr, apar, affaire, abhor, aper, abhorrer.